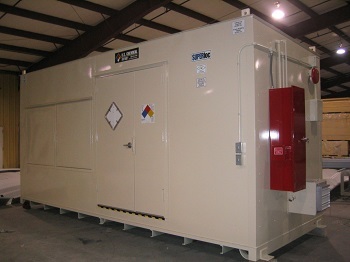 Bulk paint storage buildings by US Chemical Storage. OSHA classifies paints under “flammable and combustible materials” with requirements for storage, handling and transporting. Storing and handling large volumes of paint inventory can be extremely dangerous. Proper bulk paint storage buildings as well as mixing and dispensing units can provide safety to personnel and facilities in the surrounding area. Paints storage that exceeds 60 gallons must be stored in a completely sealed paint storage building. Paint storage buildings that are near or inside occupied facilities must meet specific fire-ratings listed by the National Fire Protection Agency (NFPA 251-1969). Storing paints inside a paint storage building will not only increase safety measures, but can increase production and help organize inventory when dealing with large volumes of paint. Shelving and racking systems allow inventory to be strategically organized and can eliminate stockpiling inventory. Paint storage lockers provide a dry storage atmosphere to maintain inventory in its original state. Paint storage lockers are designed for extreme weathering conditions while providing a long lasting shelter for keeping paint inventory safe and secure. Paint storage buildings allow inventory to be maintained in any type of climate, while maintaining a safe internal environment. Bulk paint storage should be kept in climate controlled storage buildings equipped with fire suppression systems. Inventory must be stored in approved containers, general container sizes are five gallons or less. Bulk paint storage buildings should be equipped with proper mechanical ventilation to provide consistent airflow throughout each room, if more than one storage room is being utilized. Shelving and racking systems allow easy, organized storage solutions for bulk paint storage. Do not store incompatible paint materials inside the same room. Utilize solid fire-rated or non-fire rated partition walls to separate incompatible substances, to create a safe storage atmosphere. US Chemical Storage’s paint storage buildings meet EPA, OSHA, NFPA, IFC, IBC regulations and FM approvals or Warnock Hersey standards. Contact US Chemical Storage online or call 866-591-8190.